After being forced to wear the top badge, Jenni created the second one and “wore [it] for several months before anyone noticed.” Bravo! Love the original. “HOW MAY I SERVE YOU?” So intimidating! HomeSat? can someone help me with this? i’m sure i’ll kick myself when it’s defined …. 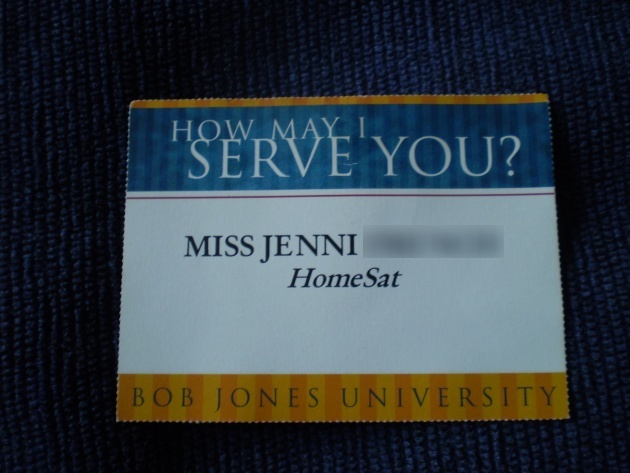 HomeSat was a program that offered BJU classes to homeschoolers via satellite. The program has since been canned, to my knowledge. I did Homesat from 6th grade till I graduated. I loved it. My favorites were the live HS classes like biology and chemistry. Mrs. Slocombe, are you Free? Captain Peacock, I do not respond to any man’s finger. please,please, please, don’t do any p—y jokes! Yes, but it was sooooo tempting. Most excellent! What I want to know, though, is what happened once someone noticed. Were there consequences? My boss noticed eventually. He walked past my cubicle, then turned and came back and walked past again. Boss: Can I see your badge, please? Boss: Did you do this yourself? Me: Yes, sir. [begins to reveal original badge beneath new badge] I still have the first one. I’ll wear that one from now on, sir. Boss: Actually, can you make me one of these? HomeSat is now a web-based program. My brother works there. Why is the “Miss” neccesary? I don’t usually see titles on badges. Ha, ha Jenni! Why am I not surprised these surfaced on this site? Escapee, at BJU the titles are very important. I had to call my best friends “Miss” when they became grad students and I was still a senior. Was it only in my weird camp that we were to call men “Brother so-and-so”? No, that was common all over. Except at PCC where “brother” and “sister” are stated as not being proper titles to use in a college setting. Unless you are the results of my mother spending eight hours in a delivery room screaming “Get It Out!” at the top of her lungs; you are not my brother. This is great. I love it. I also hate having kids call someone “auntie” or “uncle” when they are not that kids aunt or uncle. I didn’t really hear people called “Brother Ed” until I graduated from BJU and went to a rural church in the midwest. I’m still self-conscious about calling older folks by their first names, and I like it better when bank tellers, doctors, etc. call me “Mrs. Doe” than just “Jane.” I’m a bit old-fashioned that way. I think it’s far rarer outside of HAC. Preacher Boys @ PCC were the only ones I knew who used Brother/Sister commonly, and I’ve never seen the abbreviated “Bro./Sis.” thing anywhere else. Speakers in chapel would be introduce with Brother @ PCC (I never realized that was kind of a left handed compliment that they hadn’t done enough reputation building to get an honorary Doctorate yet till well after I’d left. I’ve seen/ heard it in many rural (non HAC) good/reasonable IFB churches, but I’d just never been to a church that seems to make it as ubiquitous as HAC and their clone churches seem to (admittedly from afar). I could be way off, is just my experience. And I used Homesat too. It was okay. Mrs. Vick’s English rocked. Yep, I had undergrad friends who had to refer to me by Miss [insert last name here] when we were on campus or in public. It was SOOOOOOO silly, and it brainwashed me so that now I have a problem calling any adult by his/her first name. See, I still can’t handle it when a kid calls me, “Miss Christine.” I get that same feeling that I get from nails on a chalkboard. It is visceral. In the South, the tradition is that all women are called “Miz”; single women are called by their first name “Miz Sally” and married women are called by their last name “Miz Jones”. I was in college the first time people started saying “Sir” to me — I didn’t like it; it made me feel old! Does anybody else remember Sarah Oliver, the very sweet retired staff member who lived in the bottom of Mary Gaston? She worked in the Snack Shop back when my dad was a student in the early 60’s, and I guess she worked there for decades. Everybody called her Miss Sarah. That may not sound so unusual, but we always addressed every other woman on campus with a Miss or Mrs. and their LAST name. Miss Sarah was the only adult woman that we all called with her first name. Would anybody like to guess why? I remember Miss Sarah, and I know exactly what you’re talking about, too. I never thought about it that way before, but that is really, really sad and kind of pathetic of us BJUers, isn’t it? It’s an old school Southern thing- particularly in SC to call a lady Miss So-and-So, regardless of ethnicity. The Miss or Mrs. is customary. In some circles it is also customary to address white women with their last names, and African-American women with their first names. Not just at BJU, but in lots of the south–it even gets a mention in the John Grisham books (see “The Chamber”). What’s even worse is that some people just plain called her Aunt Sarah, and I’m not talking about people who had a close relationship with her. Ew. Sounds like Zombie U to me. 😀 Snicker, snicker. Win-win. Especially with your boss wanting one. Jenni, Jenni who can I turn to? 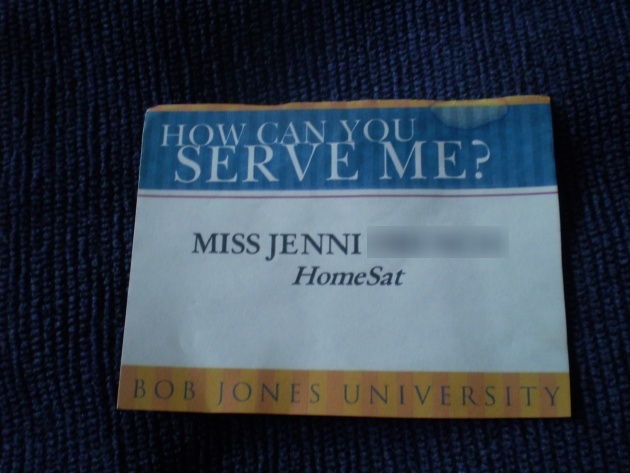 When I was a student, I managed to score a “host” badge. That was a great artist series.